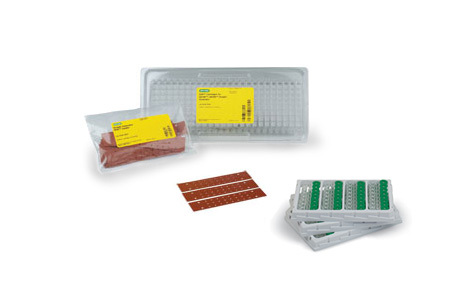 DG8 Cartridges are intended for use with the QX200™/QX100™ Droplet Digital PCR (ddPCR™) Systems and enable droplet preparation of up to eight samples at a time. Droplet generation takes approximately 2 minutes for each set of eight samples (30 minutes for a 96-well plate). All eight sample wells in the DG8 Cartridge must contain sample (or 1x buffer control), and all eight oil wells must contain Droplet Generation Oil. DG8 Gaskets are used for sealing DG8 Cartridges and are provided with the QX200 Droplet Generator. The DG8 Cartridge Holder (1863051) is required for positioning and holding the cartridge and is provided with the QX200 Droplet Generator.